Thou didst feel the Power of God's grace whilst yet in infancy, blessed Matrona, stretching forth to the holy icons, and with a pure heart and infant lips proclaimed praise unto God: Alleluia. 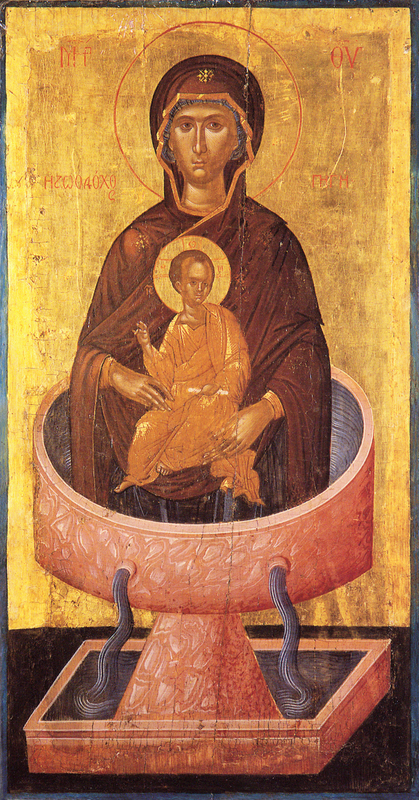 Wishing worthily to glorify the Most Holy Lady Theotokos, mother Matrona, thou didst order the people to have her depicted in the most honourable icon called "Seeker of the Perishing" and place it in God’s church in thy village, that all who look upon the bright face of the most pure one, might tenderly praise her, and to the Lord also cry out: Alleluia! The Holy Monastery of the glorious Great Martyr and Healer St. Panteleimon is found on the north limit of a property of the founding and historic Holy Monastery of the Bodiless Powers, named "Petraki", which is in the area of Kokkinara of Mount Penteli, a short distance below the peak of St. Panteleimon (870 meters). This property (6,000 stremata then), as it appears in the Great Codex of the Kyriarchou of the Holy Monastery, on March 29th 1837, was purchased (as also its whole property and not from gifts) from those who were then living there in asceticism for their benefit and relief, because after the armed and glorious revolution of [Greece] in 1821, the Holy Monastery was stripped of many of its properties, which it gave to the then newly-organized State, for the creation of a series of common works. Within the scope of the Monastery were built the Hospital Artetaion, Evangelismos, N.I.M.T.S., The Children's Hospital, etc. the Academy, the National Library, Alse Sygrou, and Pangratiou, City Schools and Parks, the Workhouse of the Merciful for the Poor, the Marasleios, the Gennadeios, and other important buildings of the capital. In the property of Kokkinara, therefore, there was a church in the name of the Holy Great Martyr Panteleimon, along with some cells, which were used at times by some Fathers visiting the Holy Metochion (Dependency). It should be noted that the area was inhabited from before then. 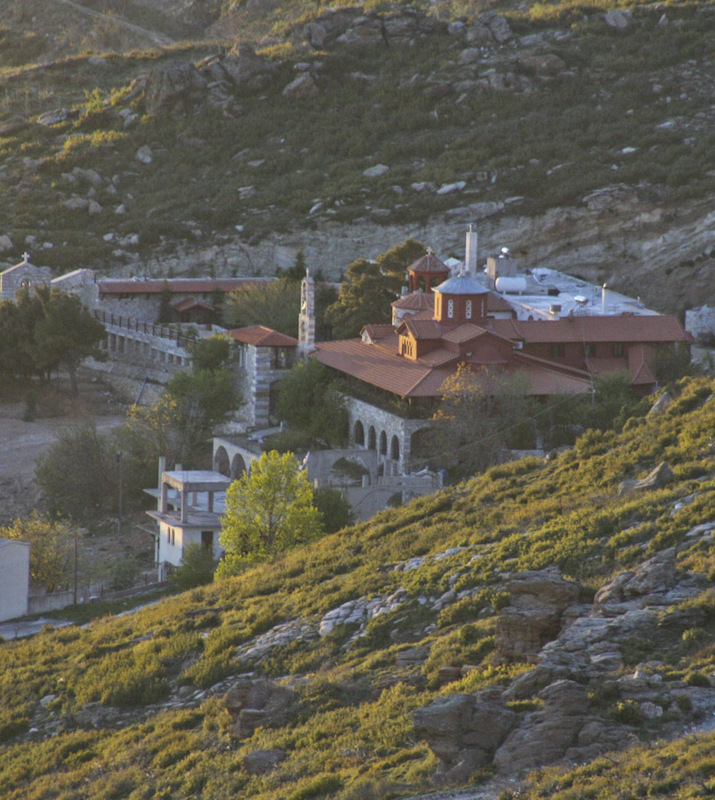 The Abbot of the Monastery of Penteli, Kyrillos Degleres, in his Apomnemoneumata mentions that "he (the founder of the Monastery of Penteli, St. Timothy, before 1578) went from end to end of the Penteli mountain, finding there various learned clerics inhabiting it, wherever on the mountain there was water and a church, including St. George Kokkinara, St. John, St. Panteleimon, St. Luke, St. Chrysostom, St. Nicholas in the Cave, the Taxiarchs in Kamari, the Frankish church at Boyiate, and St. Peter. All of these places were on Penteli Mountain, and those who dwelt on it were marked with gardens, for in all these areas there was water." 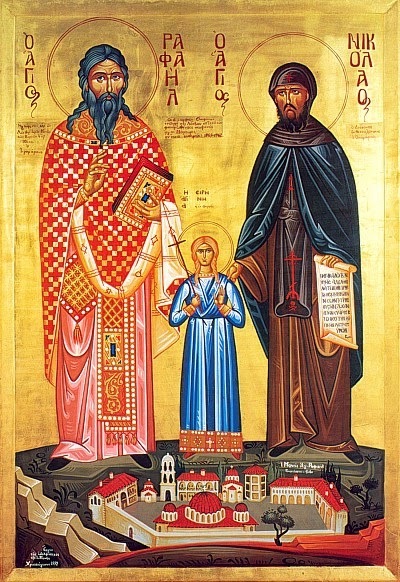 (V. D. Kampouroglou, History of Athens) These learned monks, with their meager belongings and their small synodeies, descended from their cells to the Monastery which was founded by St. Timothy for Liturgy, and eventually joined the Monastery of Penteli. This property was noted in the codex of Petraki Monastery as "a marble-bearing area". Truly, the whole Mount of Penteli was known since antiquity as the most ancient marble mine, of an exceptional amount, the white marble of with which was used to construct many ancient and newer monuments of Athens, such as the Parthenon, the Erectheion, the Propylaia, the Theseion, the Temple of the Olympian Dios, the Academy of Athens, the Palace of Otto (today the Greek Parliment), etc. Three were the most significant mines that functioned on Mount Penteli: "Raikou", "Maltezou", and "Kokkinara". With the State law (669/77), however, the uses of the southwest mountain for mining marble were stopped. Because of this, however, Mount Penteli was then proclaimed a "place of special natural beauty". The recent fires and the former mining of marble had destroyed much of its natural beauty, despite the activities to fill the area with material from the construction of the Attica highway. In 1965, the ever-memorable Elder Simon Arvanitis, the then Priest of the parish Church of St. Barbara Lykovrysi of the Metropolis of Attica, requested and received the Dependency of St. Panteleimon with the desire to render it a workshop for souls. And this granting of rest through the Mystery of Repentance on the one hand was through the asceticism of the Fathers that had come to dwell with him, and on the other hand, for the many multitudes of pilgrims and spiritual children of his. He built a new Church, cells, supporting areas and reception spaces for the many pilgrims, who began to flood the Dependency. 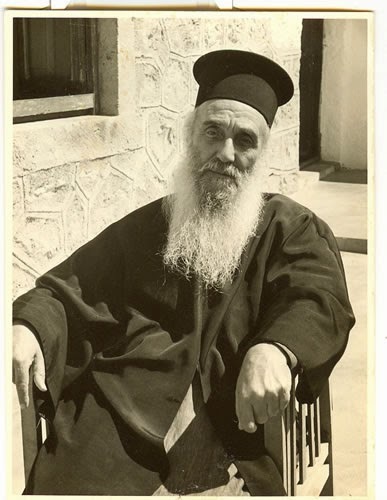 In the place of the ailing Elder Simon (+1988) was placed in 1984 Archimandrite Joseph Manettas, and in 2007, at the decision of the Abbot's Council of the Monastery, the Metochiares (Head of the Dependency) was made Archimandrite Onouphrios Kostopoulos. Today, at the Holy Dependency of St. Panteleimon, there are nine monks and hieromonks living under Elder Onouphrios, taking up the struggle to remodel and beautify it. Besides the former Fathers of the Dependency, since 2007 six new Fathers have been tonsured by [now Bishop] Iakovos Mpizaourte, taking up the "good fight". 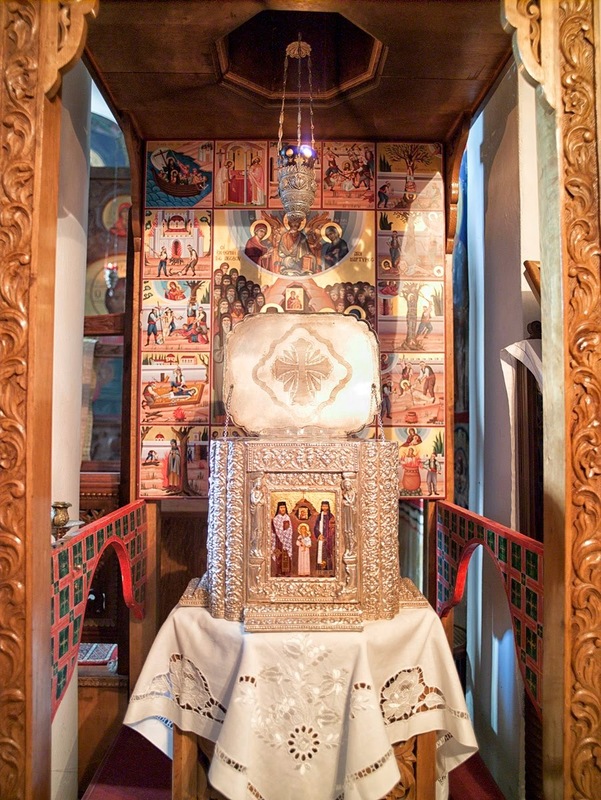 Outside of the Katholikon of the Dependency are Chapels dedicated to St. Nikodemos of the Holy Mountain, the Transfiguration of the Savior, the Holy Apostles (where are preserved many holy relics of various Saints), of St. Nektarios, and of the Akathist hymn. 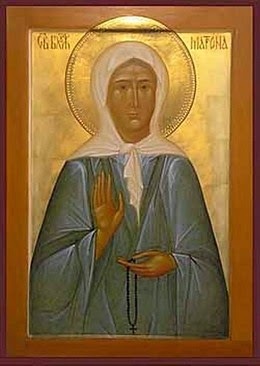 In the Holy Dependency is preserved a portion of the Precious Relic, and also the Holy and Honored Icon of the Wonderworking St. Matrona of Russia, the Blind, through which countless miracles have taken place, and which have become a wonderworking spring of healings for all those who hasten to venerate the Saint with reverence. 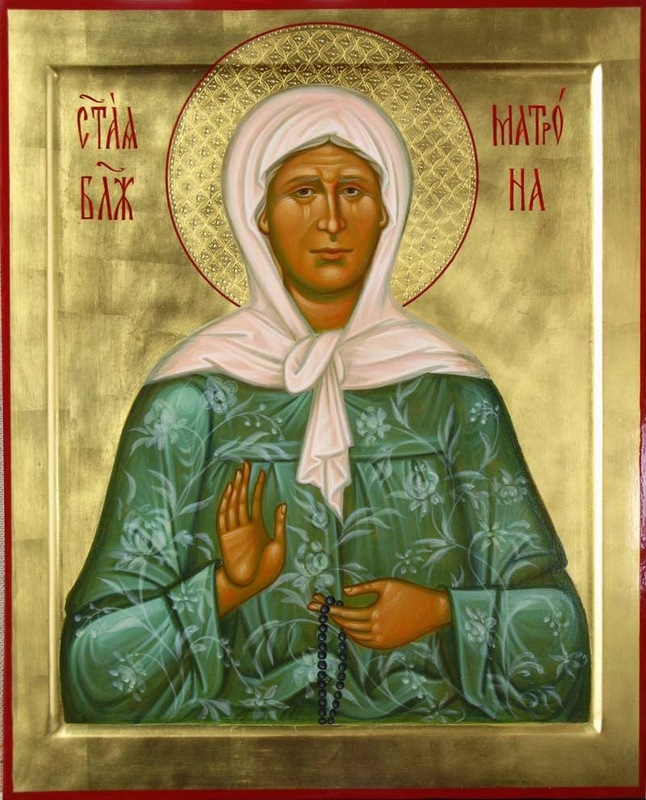 Witnesses to the incomparable miracles that are worked are the countless offerings placed upon the icon by the faithful, along with the many fragrant flowers which they offer in her honor, as she had great love for them during her earthly life. Her memory is honored with a festal holy Vigil from May 1st - 2nd every year, during which a multitude of the Faithful approach this place to honor this great and wonderworking Saint of our Church. -Tuesday to Friday - 9AM-1PM, and 4PM until the end of the service. -Every Monday the Dependency is closed to pilgrims. Daily services (Vespers, Orthros and Divine Liturgy) are celebrated in the evening (beginning at 8:30PM). The morning of the following day there is no Divine Liturgy, and the gate of the Monastery opens at 9AM. Saturday and Sunday Vespers are celebrated at 6PM, and the Sunday Divine Liturgy is at 7AM. And the rest confirms the canonical program of the Holy Dependency. Below you will read another clear example of our living faith and the palpable presence of the Saints in our life. The cardiologist Mr. Vasilios K. confesses an astonishing experience and a great miracle by the great Physician, our Saint Panteleimon. I will mention in detail one of the many medical miracles which many of my colleagues have experienced in their medical careers without always being communicated publically. It was the summer of 2000 or 2001, I don’t remember the exact year, and I was on call as the specialist Cardiologist in the Hospital “Soteria”. I always took the so-called “German time” [shift] 3-6AM. Like every call, even though it was summer, it was sufficiently exhausting. After 5AM, however, there were no patients coming to the emergency room. It was the morning of July 27th, and at 6AM I went off shift. At 5:55AM, I, exhausted but joyous, began to gather my things to begin my vacation, and to close my call book to leave. I ran over and began resuscitation, defibrillation, etc. We worked on her for a while, but the patient had flat-lined and cardiac, pulmonary and cerebrally the patient was dead, and the nurses were preparing to transfer her to the morgue. Deeply upset for this young woman, a thought struck me like lightening, that it was the feast of St. Panteleimon. I grabbed the defibrillator and entreated within me: St. Panteleimon, you are a physician, help this young woman today on your feast.” Immediately I did the medically pointless defibrillation, because the monitor showed no signs of life, but the monitor them immediately began to show a heartbeat, pointing towards a heart attack. Immediately we took her to the cardiac unit. Note that the woman, throughout our whole encounter, did not see me at all, for she was in cardiac arrest or in a coma. I left exhausted for my house, and I put the event out of my mind for the rest of my summer vacation. I returned on August 14th at 8AM for work, and when I greeted the nurses of the morning shift, immediately I remembered the event. I asked if the patient on that call was still living, even though I didn’t remember her name, and the nurse replied: today, she is going to that room. Without wearing my jacket, I ran to the room that she indicated. Without speaking I saw a woman who was eating her breakfast sitting upright. As soon as she saw me, her face shown, and she said: “Thank you for saving my life.” I told her that, no, someone else had saved her. With tears in my eyes, she showed me an icon on her bureau. It was St. Panteleimon. Truly moved and shaken, I left her room without saying another word. To this day, I do not know the name of this woman. This is a sign of the living presence of our faith in God and of our Saints. 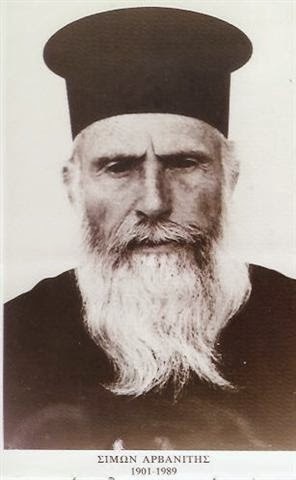 Elder Amphilochius Makris (+1970), along with several other Elders from the 20th century are likely to be canonized soon, according to some sources. Please see the link above for the life of this great Elder, full of grace, and a true spiritual guide to many. May we have his blessing! 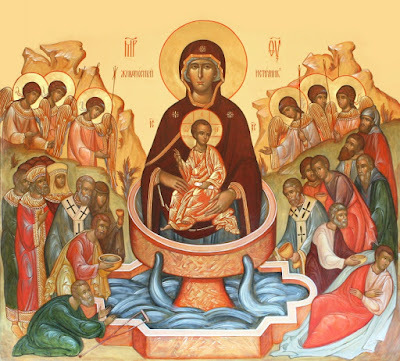 Excerpt from the Akathist to the Theotokos, the "Life-giving Spring"
Note: The following is an amateur translation from the Greek text, and as such, I request reviewing the translation before any public / liturgical use. Also note that the meter of this translation is not set to match the original music. Finally, please note that the Greek source text is missing several pages (about 4 sections in all), so if anyone if able to provide these, I would be happy to complete the translation. May the Holy Theotokos fill our lives with healings of soul and body as we praise her Son Who is risen, and her who gave birth to Him! Rejoice, O water of salvation. Rejoice, through whom the curse has ceased. Rejoice, the fulfillment of the Will of the Most-High. Rejoice, for He Who was born from you is Holy. Rejoice, you who are glorified unto the ages of ages. Rejoice, through whom we partake of healing. Rejoice spring of saving water. The God-seer [Moses] beheld you as the [Burning] Bush, when he heard the Divine voice, while Leo the great King, within the forest, having heard your holy voice, found the water, and in astonishment cried out: Alleluia. Rejoice, glory of the whole world. Rejoice, the meditation of my wretched soul. Rejoice, for you nursed Him Who is the nourishment of all. Rejoice, for you were paradoxically born of a barren womb. Rejoice, the cornerstone of our salvation. Rejoice, for you are the help that is sought for. The power of the Most-High, is truly beheld in the waters of your Spring, O Virgin, for those who hasten to it: blind, deaf, and all people in general, partake of healing of soul and body, crying out: Alleluia. Rejoice, the radiance of Orthodoxy. Rejoice, the sacred boast of Patriarchs. Rejoice, for you are the shepherd staff of noble Hierarchs. Rejoice, the joy and rejoicing of deacons. Rejoice, the great nourishment of the Ascetics. Rejoice, the protector of victory for the upright. Rejoice, krater of the ever-flowing stream. Rejoice, the healing of all who cry out: "Mariam"! Rejoice, for you cleanse the souls of men. Rejoice, you who deliver from every danger. Rejoice, for you we call upon in faith. The young man from Thessaly, you suddenly raised by the three-fold pouring of water, and though he was dead, he had longed [to venerate you], and you brought him again to life wondrously, as he glorified, and magnified and chanted together with all: Alleluia. Rejoice, the supplication of the mourning. Rejoice, the dissipater of spiritual passions. Rejoice, the speedy correction of those sick in the mind. Rejoice, for you deliver all souls. Rejoice, giver of every good thing. 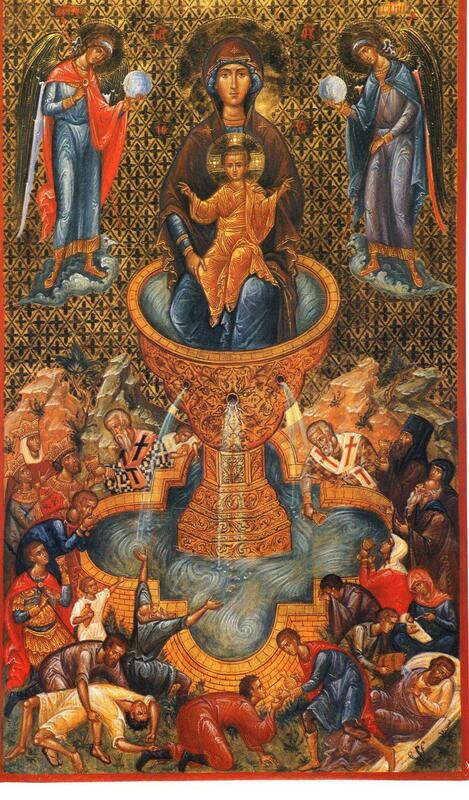 Rejoice, from whom divine streams pour forth. A ladder reaching from earth to heaven, you appeared to be, leading from earth to the heights, which our Forefather Jacob saw formerly, which God placed on the earth, O All-pure One, showing you to be a spring of life for us who cry out: Alleluia. Rejoice, the salvation of men. Rejoice, the boast of the First-formed [Adam and Eve], O Pure One. Rejoice, for you are the mountain which Daniel foresaw. Rejoice, for you are proclaimed the Mother of God. Rejoice, for you are the Queen of all women. Rejoice, the glory of all the Saints. As the Church of your Spring was going to be trampled upon, O Most-Pure and Holy Virgin, you kept it upright until the multitude of the faithful had left, for you do not desire the death, but the life of those who cry out: Alleluia. Rejoice, you who draw up praise from babes. Rejoice, for you stand to help mightily. Rejoice, for you have become my protection and deliverance. Rejoice, the protecting-wall of the faithful. Rejoice, the correction of those who are guilty. 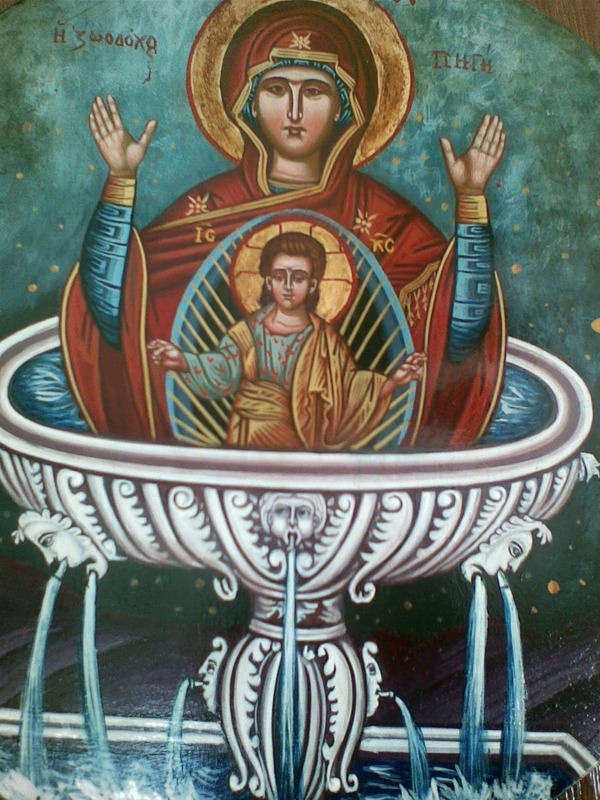 The water of your Spring, O Virgin, has worked strange and awesome deeds surpassing words, and your deeds are strange to hear and surpassing nature, but for us who believe, we venerate them, crying out: Alleluia. 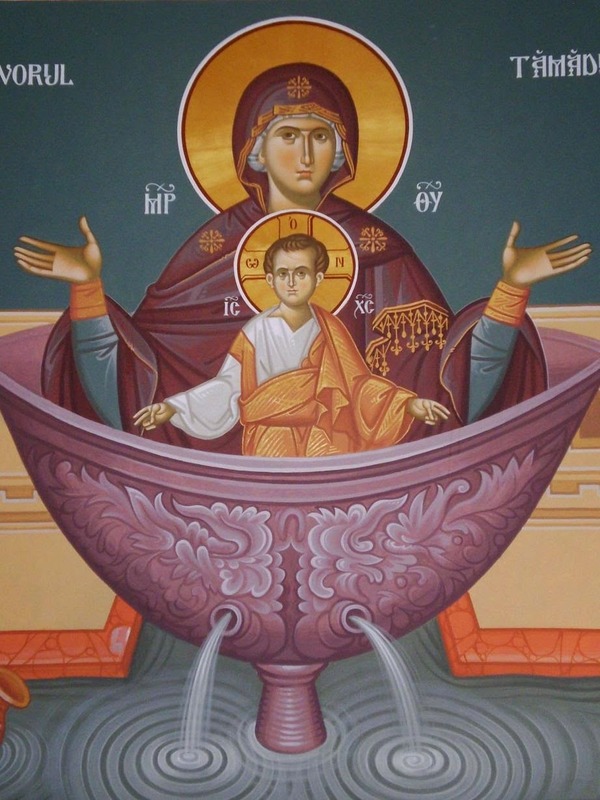 The water of incorruption and drink of ambrosia, and the wine bearing nectar, with joy O brethren, let us drink of with joy and fervor, from the Life-bestowing Spring, and let us venerate her all-sacred Icon, crying out: Alleluia. Rejoice, she who is blessed among women. Rejoice, you who bore the Giver of good things. Rejoice, for the fruit of your womb is blessed. Rejoice, through whom the bitterness of the curse has ceased. Rejoice, for you cast out the leader of delusion. Rejoice, for your wondrously multiply your Spring. I cry out to you “Rejoice”, as you unspeakably have birth to the joy of the world, O Theotokos, and at all times I entreat you to ever make me a partaker of your joy, that with a voice of exaltation and a hymn of celebration you might hear: Alleluia. Rejoice, the ode of your inheritance. Rejoice, the hymn of choirs of musicians. Rejoice, the song of Solomon praised by every breath. Rejoice, for you enlighten the fools through your light. Rejoice, you who save the souls of your servants. Rejoice, in whom I place my hope when I die. O Life-giving Spring, which pours forth deliverance to all of soul and body, (3) receive this poor prayer, and deliver from dangers of all kinds, and deliver from eternal punishment, those who cry out: Alleluia. And again Ode I, followed by the Kontakion. On June 21st 1995, 46 year old Katerina N. T., an inhabitant of Kalamarias, Thessaloniki, after a terrible car accident, was transferred to the Hospital “Papanikolaou” with a serious cranioencephalic condition: her skull on her forehead was traumatized, and her meninges, blood and soil were mixed together on her forehead. After five hours in the operating room, they took her to the ICU. Objectively, the doctors did not give her any hope of living, not even one in a million, and they said that if she would live, she would be a “vegetable”. Her relatives, full of agony regarding her state, but also with deep faith, all night entreated St. Raphael. 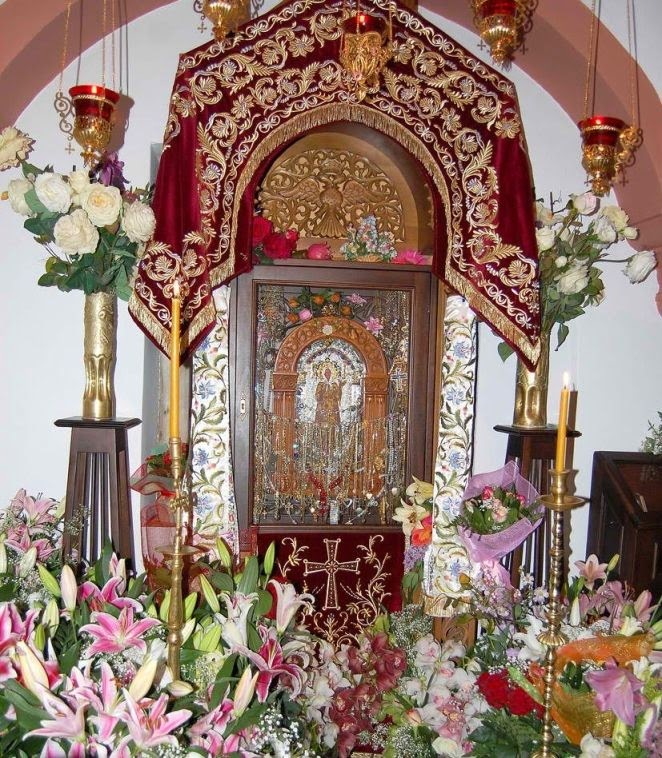 The next day they learned that there would be a vigil at the Holy Hesychasterion of the Precious Forerunner, Metamorphosi, Chalkidiki, where they took part and gave her name to be commemorated in the Holy Proskomidi [Oblation]. They left with souls less burdened, full of hope in God, even though the medical state of the sick woman was hopeless. The next evening, the medical information was disheartening. Some doctor told them that the cranioencephalic damage was so severe that he could not leave them any hope, other than if she could get a “head transplant”! The mother, when she returned to the ICU after a few days, could not recognize her daughter if the nurse had not pointed her out to her! 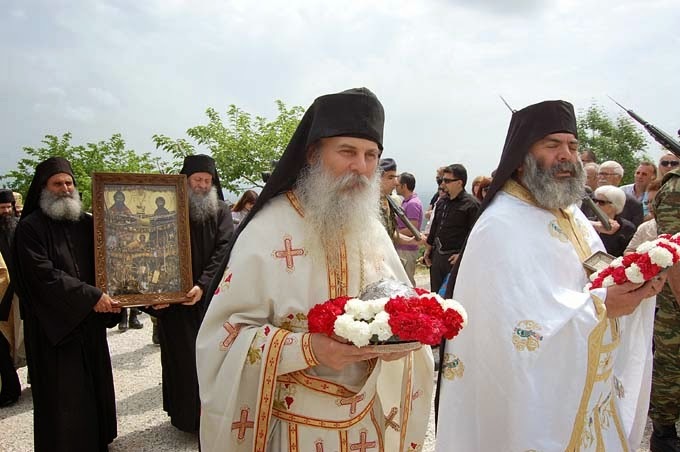 Sunday June 25th, they went in the morning to the Monastery of St. Raphael in Griva of Goumenissa. 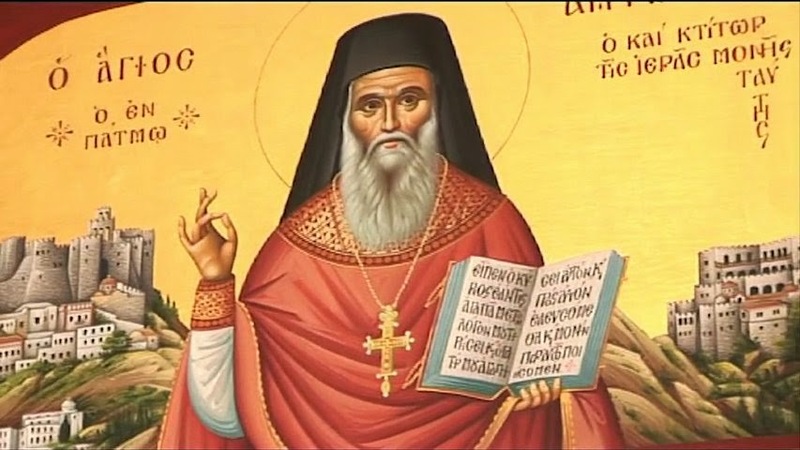 The Metropolitan of Goumenissa, Demetrios, was serving Divine Liturgy, and he told them not to loose hope, but to entreat the Saint, and he will work his miracle, as so many unbelievable miracles had occurred up to that point. They kneeled with tears and prayed in the Paraklesis which they asked to be served after the Divine Liturgy. They took holy oil and water. 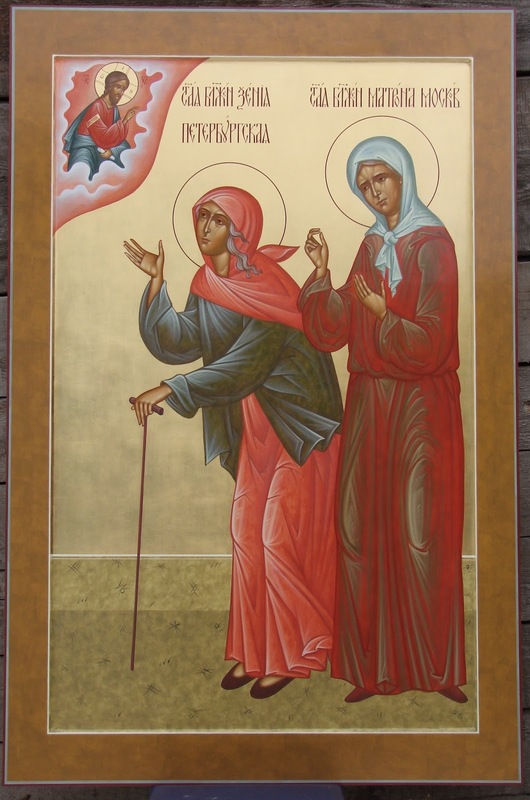 They then descended to the Holy Monastery of Panagia in Goumenissa, and were received with pain of soul before the wonderworking icon that this miracle might occur. Daily they served Paraklesis to St. Raphael and to other saints in Thessaloniki. In the daily Divine Liturgies and holy Paraklesis services at the Monastery, they would continuously remember the name of the sick woman. 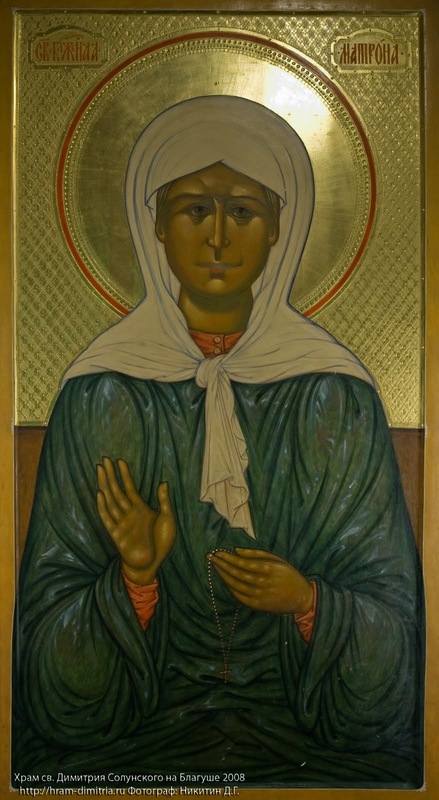 On July 2nd and 9th, both Sundays, at dawn all her relatives again ascended to the Holy Monastery for Divine Liturgy, and gave a prosphoro with the name of the sick woman, praying with deep faith and hope, kneeling with tears in the Paraklesis after the Divine Liturgy. On July 9th, there happened to also be a busload of pilgrims from Kozani who also prayed with them fervently, chanting along with them “Lord have mercy” in the Paraklesis. The next day, after 18 days in the ICU, the sick woman recovered! The miracle had occurred. The objectively negative scientific prognostications were reversed! And while the previous days there was a significant risk of meningitis or stroke, ultimately, the Grace of God prevented these dangers. They transferred her to the Neurosurgical Clinic, from which she was discharged. When she recovered somewhat, they ascended as a family to the Monastery and had Divine Liturgy served. She entered the Hospital again for plastic surgical repair of the bone of her forehead on September 20th, and again, on October 10th for another procedure on her eye and on her jaw. All of the surgeries were successful. After the most recent test, Professor F. confirmed that there was no more problem, despite her near death adventure. In August, the woman who was healed, one night in her sleep saw that someone was knocking on her door, and opening it, she saw St. Raphael. She entreated him to come into her home to help her, but the Saint told her: “You don't have any more need, you are no longer in danger.” She awoke full of joy for the protection of the Saint. And her husband was made worthy to see the Saint once in his dream fully alive in their house, for the first time. In the beginning, he did not understand who he was, and he was afraid of this unexpected visitor. The Saint blessed him, telling him to not be afraid, because he came for their good. The whole family confesses the great miracle which St. Raphael worked for Katerina. They visit the Monastery routinely, to express their deep thanks to this wonderworking Saint of God. Several times, it happened that the policeman Demetrios T. was also present as a pilgrim together with his family. He was the policeman who first raced with his car to meet the scene of the accident. Seeing her state, he could not believe that she could be saved, and however, with deep faith, he crossed her with holy oil of St. Raphael, which he always keeps with him in his car, and he entreated for his intercessions for her. The Holy Monastery of St. Raphael is found on the verdant slope of the Paikou Mountain, at a height of 600 meters, with a view of the valley of Axiou, in the area of Griva, 7km from Goumenissa, Kilkis [about 1 hour from Thessaloniki]. It is a men's monastery. It was founded in 1992 by the Metropolitan of Goumenissa Demetrios and his synodeia, and it is the fruit of a special reverence towards the newly-revealed martyred Saints Raphael, Nicholas and Irene, who appeared during our era (1959-1962), 500 years after their martyrdom. It celebrates on the Tuesday of Bright Week (Monday evening to Tuesday morning after Pascha), on the day when the Saints were perfected in martyrdom in Thermi of Lesvos, 1463. Furthermore, they also especially celebrate the feasts of the Holy Myrrhbearers, and St. Basil the Great, to whom are offered chapels in their honor in the original building complex of the Monastery. The main church of the Monastery (the “Katholikon”) is dedicated to Sts. Raphael, Nicholas and Irene. There are also two chapels dedicated to Sts. Peter and Paul, and to the Apostle Andrew. Special care was given to the architecture of the church which joins the Athonite form with designs from Constantinople (a central dome, four surrounding domes, a dome above the Holy Altar, choirs, chapels, a dome in the narthex, and an external patio). Due to the complex and costly construction, the church is still not fully finished. For the completion of the church, donations can be sent to the Ethniki Trapeza 250/601365-19. 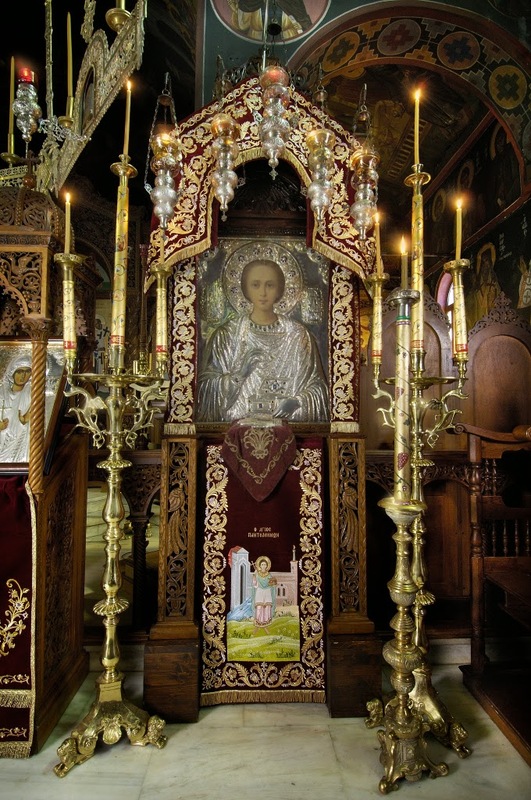 In the Monastery are preserved portions of the Holy Relics of: Sts. 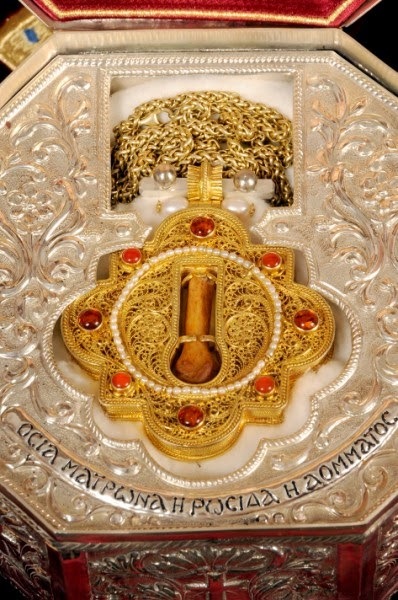 Raphael, Nicholas and Irene, St. Mary Magdalene the Myrrhbearer, and a small portion of the Precious Cross, given by the Blessed Patriarch Diodoros of Jerusalem to Metropolitan Demetrios. Divine Liturgy daily until 9AM, Sundays until 10AM. Holy Unction: The first Sunday of every month, after Vespers. The Monastery remains open from 7AM until sunset. 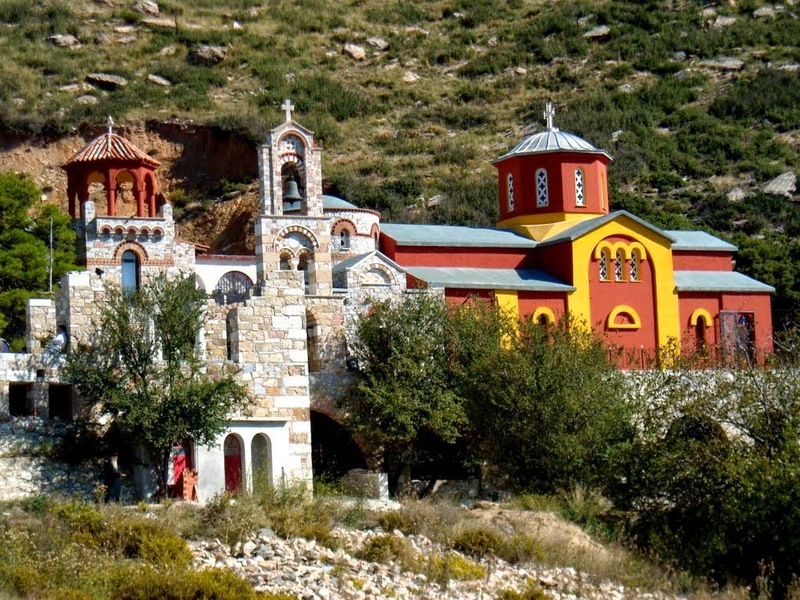 The Monastery is a place of Divine Worship, honor of the Holy Martyrs, and prayer and ascesis of the monks. Because of this, please respect the holiness of the place, and the religious consciences of the other pilgrims. Do not come to the Monastery with improper clothing (e.g. women with low-necked garments, short skirts, pants, and any provocative outfits, and men with shorts). The Monastery has many publications (including many miracles of the Saints) and many recordings of services. See the link below for some of the titles.